This week the challenge will be all about ONES since we have arrived at #111. 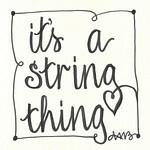 ONE string line you will create. Sound like fun? Let's begin! 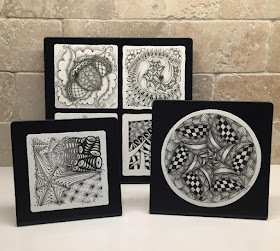 On your tile begin by tangling Hamail - draw as many or as few as you wish. Next, draw a random string line to divide the rest of the space on your tile. This is a departure from our usual exercise. Depending on the amount and size of Hamail you tangle, there may not even be a need to add a string before your favorite tangle. Step outs for the pattern can be found by clicking the name above and/or TanglePatterns. Ooh a fun one this week and everybody's will be completely different, in more than the usual way! :). Oh please say you are going to do one of your fantastic tips to drawing pages! I have filled my sketch pad with hamil and not happy with a one of them. They just don't "flow". I love the spiral effect, but mine don't have it. Help, Adele! I'll play with it a bit more and see what I can come up with for Thursday's post.